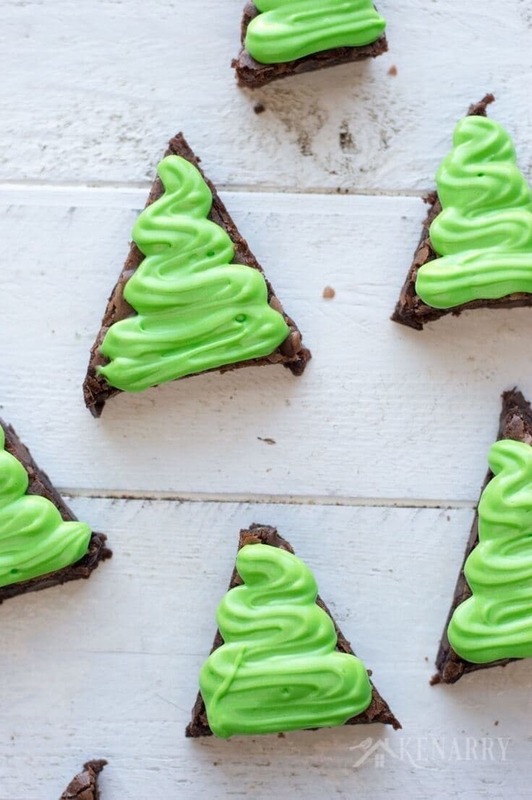 Peppermint Brownie Christmas Trees are a fun and festive way to get in the holiday spirit! Create this easy dessert idea with the kids for a party or a special treat. Happy holidays! I don’t know about you, but I love to make fun and festive food with my boys especially around the holiday season. If we make any holiday goodies that are red or green, my two boys are giddy. Throw in sprinkles and they’re bubbling with excitement. 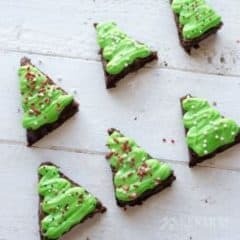 I just know they’d love this recipe for Peppermint Brownie Christmas Trees I got from my friend and colleague, Meaghan at Cook. Craft. Love. Meaghan is super creative and always has the best ideas like her Peppermint Meringues, her Chocolate Salted Caramel Tart or her Inside Out Peanut Butter Cup Cupcakes. I was thrilled when she shared her Peppermint Brownie Christmas Trees with us. 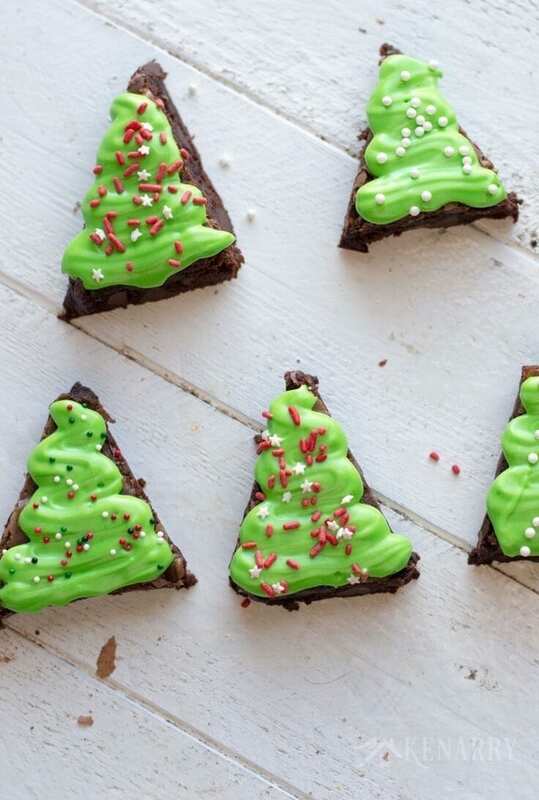 Peppermint Brownie Christmas Trees are very easy to make. In fact, you just use a box brownie mix or your favorite 9 x 9″ homemade brownie recipe. Throw in a dash of peppermint extract in the batter to give it that festive holiday flavor. Bake the brownies according to the directions on the box or in your recipe. 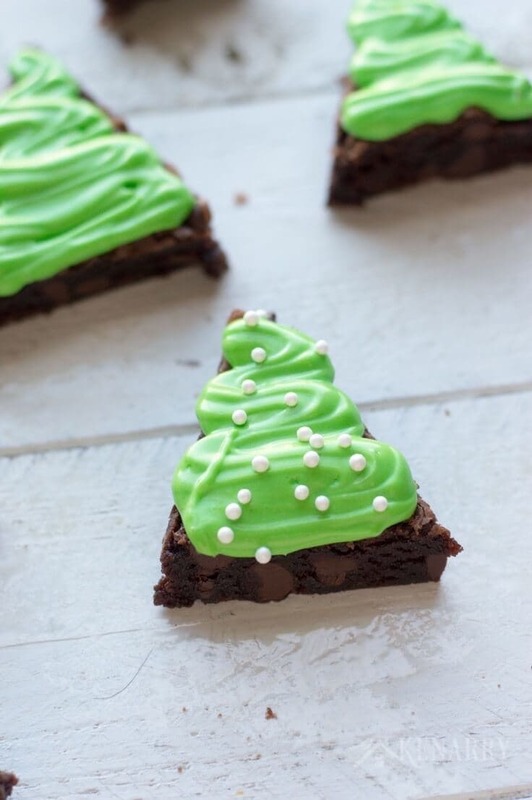 Once they’ve cooled completely, cut the Peppermint Brownies into triangles so they look like little Christmas trees. Meaghan recommends cutting the brownies into wide strips first and then trimming those down into the triangles. Next whip up a batch of homemade frosting with powdered sugar, butter, a little milk and green gel food coloring (see recipe below). 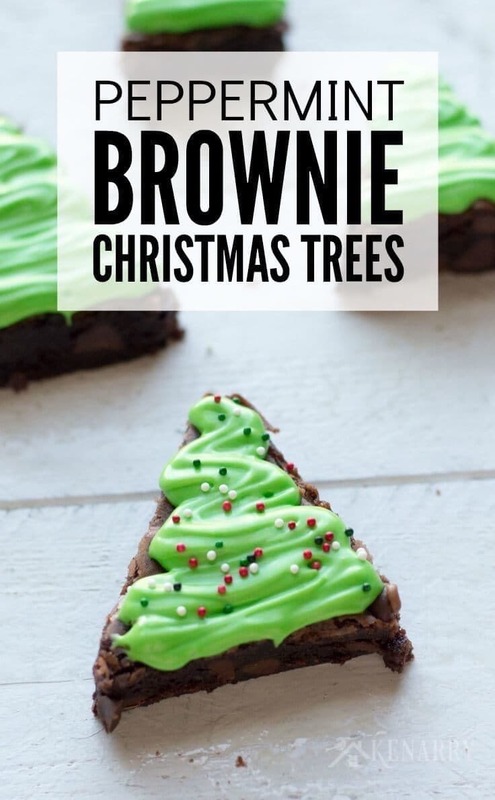 Put it in a disposable decorating bag with a small star tip and pipe it onto the brownie triangles in a zig zag pattern to look like garland or Christmas tree lights. Then comes the fun part that kids LOVE — decorating the Peppermint Brownie Christmas Trees with sprinkles! You can go really simple like these white sprinkles. 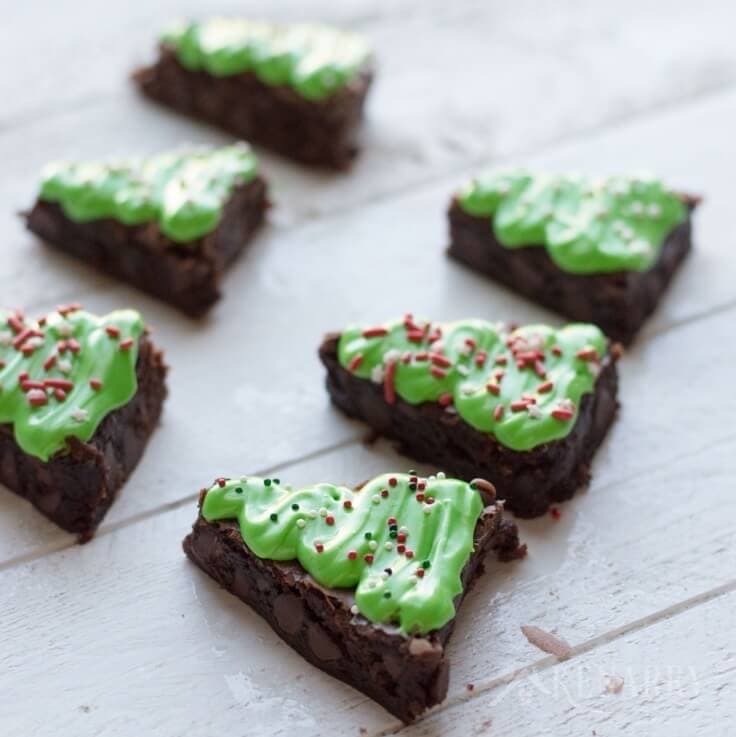 Or mix it up and use a whole variety of holiday sprinkles for your Peppermint Brownie Christmas Trees! Mix brownies according to package directions and add in peppermint extract. Bake according to package directions and allow to cool completely. While brownies are cooling beat butter until light and fluffy, about 3-5 minutes. Add in powdered sugar and mix well. Add milk if needed to reach your desired consistency. Color your frosting with green gel food color and add to a piping bag fitted with a small star tip. 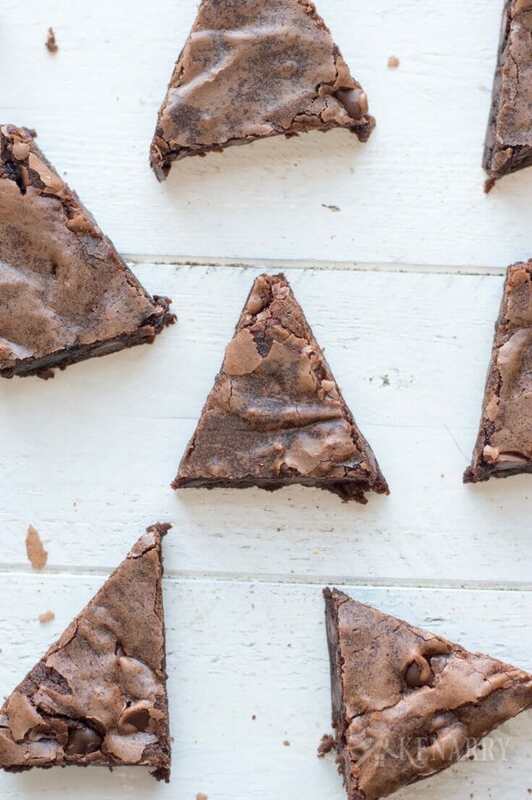 Cut cooled brownies into triangles. It works great if you cut the brownies into wide strips then trim those down into triangles. Frost with green frosting in a zig zag pattern to look like garland or Christmas lights. Allow frosting to crust for several hours or overnight before stacking to store or transport. Use Christmas colored M&Ms or Red Hots to look like ornaments. Create a little yellow frosting and put it in a decorating bag with a tip. Use it to put a little “star” at the top of the trees. Cut a miniature Reese’s Peanut Butter Cup in half down the center. Then turn it upside down and put it at the bottom of the tree to look like the stump. 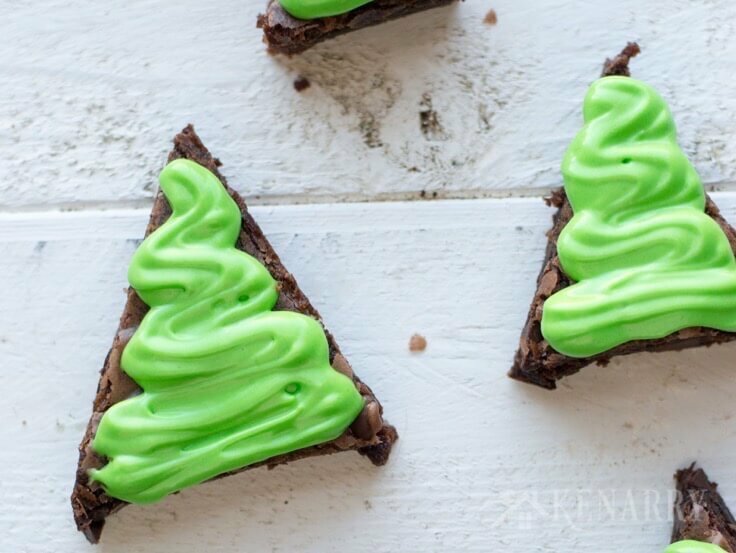 How else would you decorate these Peppermint Brownie Christmas Trees? Please comment below and share. We’re always looking for new ideas!